WASHINGTON (CNS) – Jesuit Father Edward Reese, the president of St. Ignatius Prep School in San Francisco, Calif., offered prayers in both Phoenix and Washington, including a homily at the National Cathedral in Washington, after the death of John McCain, the senator from Arizona who died Aug. 25 at age 81 after a long struggle with brain cancer. Father Reese knew the McCain family when he was president at another Jesuit high school, Brophy Prep in Phoenix, for 20 years. Two of McCain’s sons attended Brophy and McCain’s wife, Cindy, served on the board of trustees. “Don’t misunderstand me. We are not recommending John for sainthood. He was so very human and for that reason we can see God in his life,” Father Reese said. The 31-year senator, who served in Vietnam and was held captive by the North Vietnamese for six years, “was a man who loved and knew that love is seen in action – in doing,” Father Reese said. 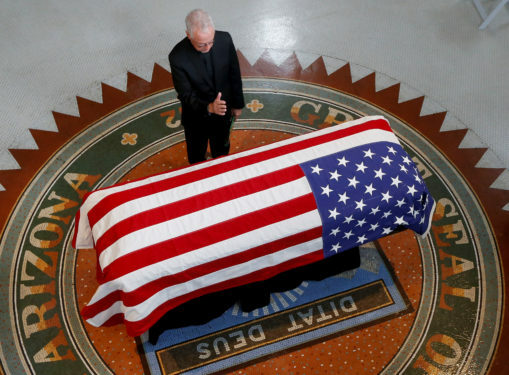 “He was so often surrounded by servicemen and women for whom he has a special affection.” In death, McCain continues to be surrounded by fellow servicemen and women; he is buried at the U.S. Naval Academy Cemetery in Annapolis, Md. McCain was a lifelong Episcopalian, but attended services at a Southern Baptist church for 17 years.